Pedicellate, complete, cyclic, bracteolate in the form of epicalyx, hermaphrodite, actinomorphic, hypogynous, regular and pentamerous. Cohesion- Monoadelphous. i.e forming a staminal tube around the style. Adhesion -Epipetalous i.e. filaments adnate to the basal part of the petal. Ovary two- many carpels with axile placentation. 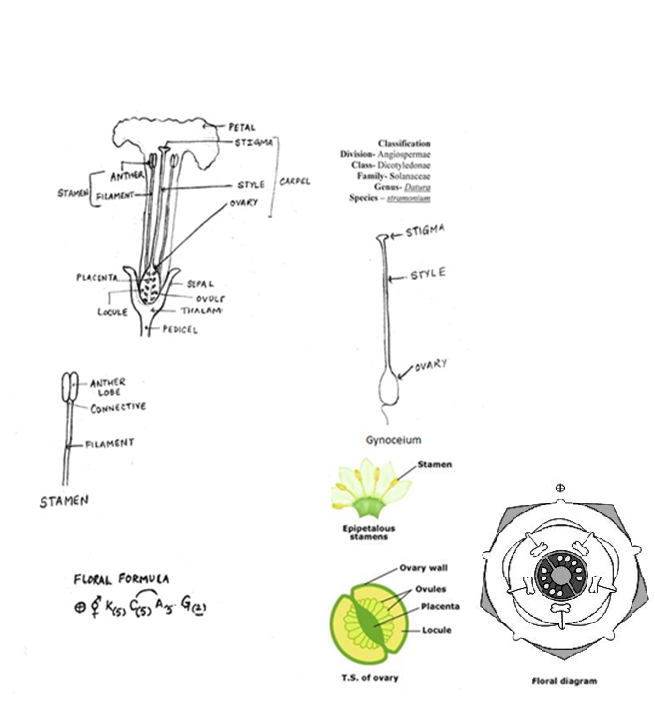 Flower: Ebracteate, Pedicellate,complete, bisexual/hermaphrodite, actinomorphic, hypogynous, pentamerous, cyclic. Cohesion: Polyandrous with long filaments. In the ovary, carpels are placed obliquely. 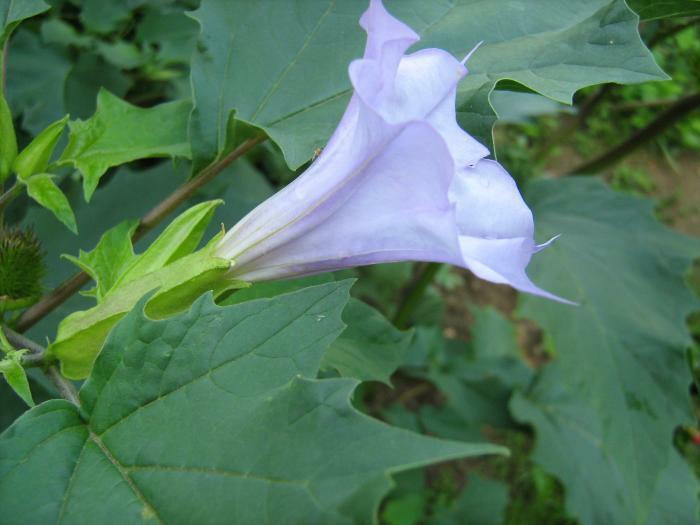 They provide several important food and medicinal plants. 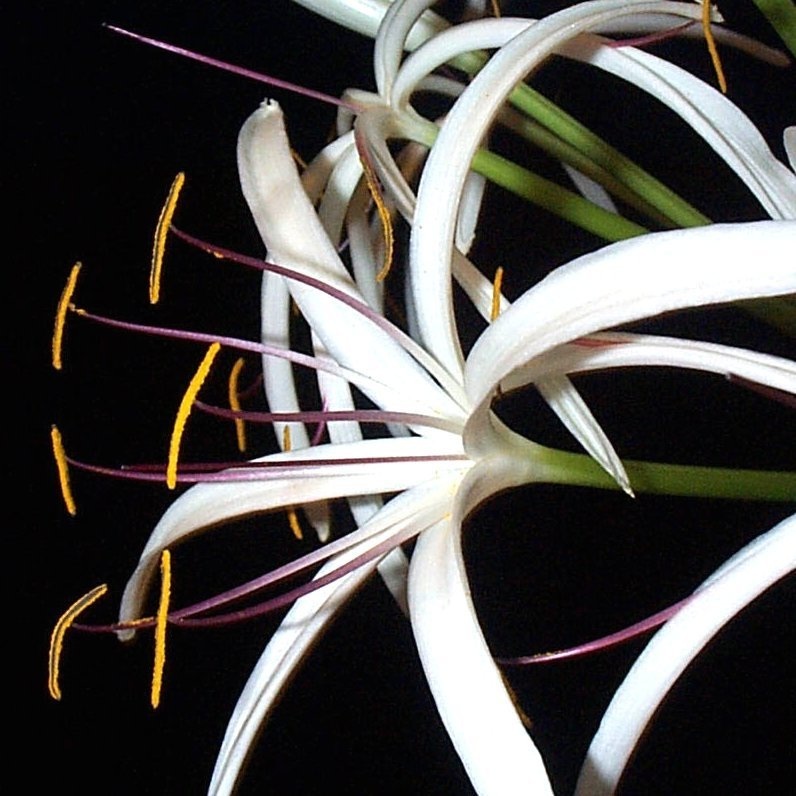 C. AIM: To study the floral characteristics of family Amaraylldaceae by dissection of Crinium lily. Flower: Bracteate, pedicellate, complete, actinomorphic, hermaphrodite, trimerous, epigynous. Arrangement: arranged in two separate whorls of three part each(trimerous). Aloe vera: Constituent of laxative preparations. Colchicum luteum: Useful in rheumatism and liver diseases. 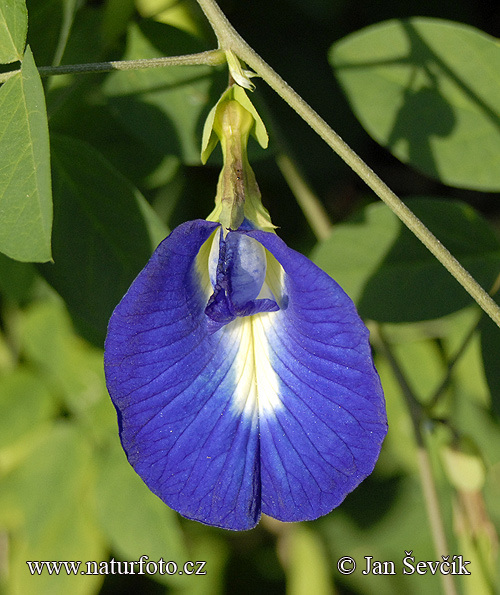 D. AIM: To study the floral characteristics of family Fabaceae/ Leguminosae by dissection of Clitoria ternate. 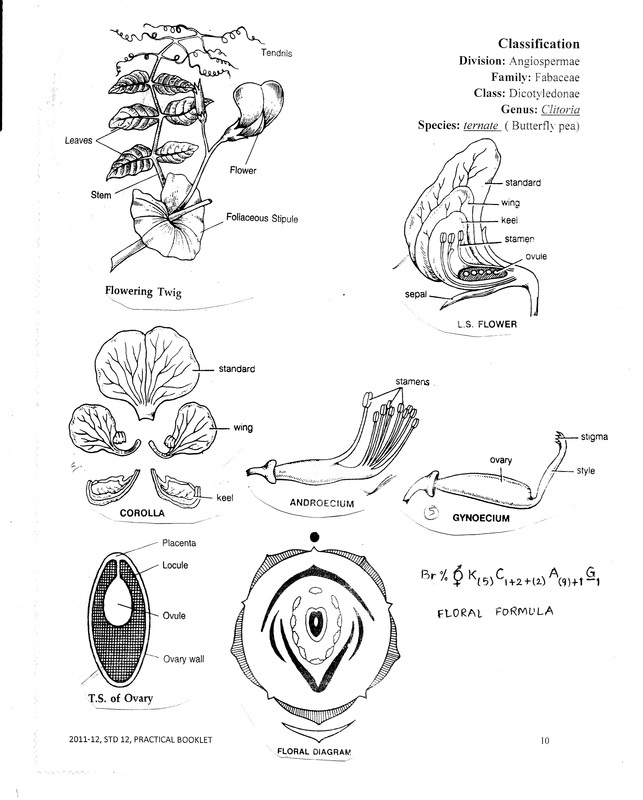 Flower -Complete, pedicellate, bracteate, hermaphrodite, zygomorphic, hypogynous, pentamerous, papilionaceous. Papilionaceous, i,e the posterior petal is largest called standard, two lateral petals are called wings and inner to anterior petals fused to form boat shaped structure called the keel. 9 fused stamens are placed anteriorly and one free is placed posteriorly. E. AIM: To study the floral characteristics of Family Asteraceae/Compositae through dissection of flower Helianthus annuus. 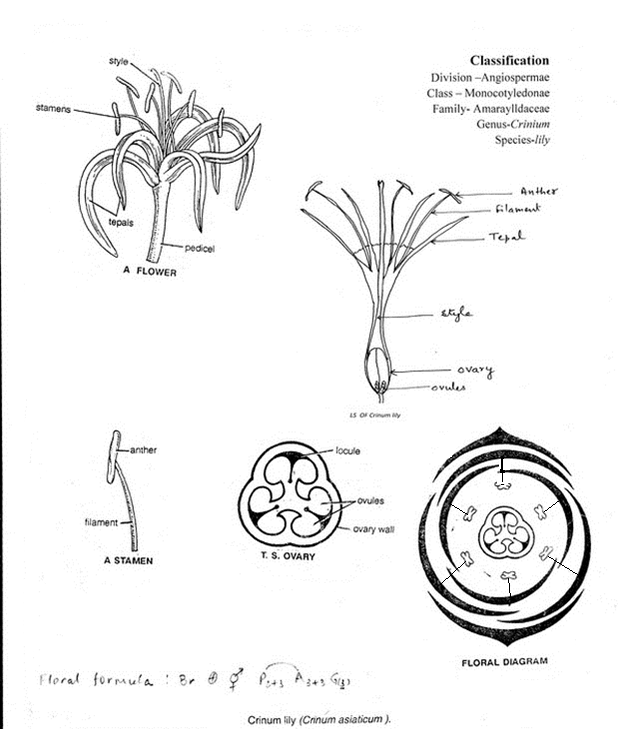 b) Disc florets tubular type. Bracteate, sessile, incomplete, pentamerous, zygomorphic, ligulate, pistillate, irregular, epigynous. Calyx: Absent or 3 and modified into pap pus. Corolla: Petals 5, gamopetalous, having a short basal tube. Position: Arranged in the central part of the capitulum. Bracteate, sessile, complete, tubular, actinomorphic, pentamerous bisexual and epigynous. Calyx: Reduced and modified into 2-3 scales called pappus. Corolla: Petals 5, gamopetalous and tubular, valvate aestivation. Anthers - dithecous, bilobed, basifixed, introrse. 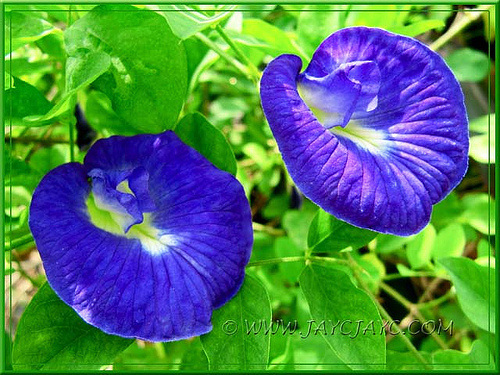 Economically important plants: Provide food, dye, oil and medicines. 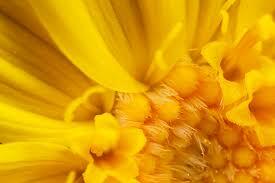 AIM: To study the floral characteristics of family Asteraceae/Compositae. Inflorescence- Head or capitulum type of inflorescence. Bracteate, ebracteolate, sessile, complete, bisexual, pentamerous, actinomorphic and epigynous. Number: Numerous, Reduced into hairy outgrowths called pappus arranged on top of ovary and persistent. Epipetalous, syngenesious and alternate with petals. Bracteate, ebracteolate, sessile, incomplete, pistillate, zygomorphic and epigynous. Number- Numerous, reduced into hairy outgrowths called pappus arranged on top of the ovary and persistent.